Jerry Kang is an associate provost and a professor of law and Asian American studies at UCLA. In present-day higher education, that may not be the case. Thus, UCLA plans to create a system of evidence-based practices to produce a fair environment for all students and faculty. In July 2015, Kang will lead the charge as vice chancellor for equity, diversity and inclusion—as unlikely a candidate as he may seem. “In some ways I am an unconventional choice, given the fact that I come from a professional school and I wasn’t a professional administrator before,” says Kang, who approaches the opportunity with determination, stating that his “slightly atypical set of motivation, skills and framing” could work in his favor. An immigrant and first-generation professional, Kang grew up in Illinois, raised by parents who came to the United States to give their children educational opportunity. Understanding their sacrifice, Kang pushed himself to excel in school. In college, even though he majored in physics, Kang also cultivated an interest in the liberal arts, from philosophy to creative writing to political theory. After working summers at national laboratories, life as a scientist lost some of its romanticism. Also, he became more politically conscious about what it meant to be a racial minority and an immigrant. Subsequently, Kang decided to go into law to try to have an impact on communities and concerns he cared about. “In America, the levers of power are often controlled by law and lawyers, so I decided to go into law to try to figure out what the deal was,” he says. Kang graduated from Harvard in 1990 and went on to pursue a juris doctorate from the institution, graduating in 1993. Kang’s research and work reflect the personal injustices, difficulties and challenges faced by minorities and immigrants. Asian Americans, for instance, although viewed often as highly competent in many fields, are not viewed as affable, he says. “We’re viewed as doing good technical work, but not especially friendly or the kind of guy you want to have beer with; and it turns out that, in many domains, not only must you be good at what you do, you must also be liked,” Kang notes. Two years after completing his law degree, Kang began teaching law at UCLA. In 2000, he helped create UCLA Law’s critical race studies specialization, the first program of its kind in American legal education, allowing students to study the intersection between race and the law. 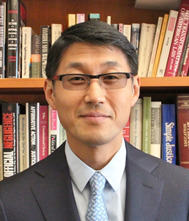 Kang is the program’s founding co-director and acted as its faculty director. He also serves as the inaugural Korea Times—Hankook Ilbo Chair in Korean American Studies and Law. As a professor, he also sees himself as unorthodox. “The way I’ve connected best with students is by setting an unbelievably high bar, making sure that students realize that what might have been good enough in other classes in prior years will not be good enough for me. I will push them to the very limits of their ability to become better and to take their own minds seriously,” he says. With this approach, Kang received UCLA Law’s Professor of the Year award in 1998, the Rutter Award for Excellence in Teaching in 2007 and the University Distinguished Teaching Award (The Eby Award for the Art of Teaching) in 2010. In his new position as vice chancellor, he plans to take immediate action, speaking with a broad swath of faculty, students, staff, alumni and members of the community to “see the world as they see it, to understand the problems they think are most pressing and to learn what I don’t know,” Kang says. With compiled data, the office will be able to ensure that the practices, policies and procedures that are in place to adjudicate complaints about discrimination are well designed, clearly communicated and have consequences.